The Fresh Produce Safety Centre Limited, a joint project of the University of Sydney and the Produce Marketing Association of Australia and New Zealand (PMAANZ), has launched in Sydney. The Centre’s Board of Directors said they looked forward to working with all sectors of the fresh produce supply chain, including growers, input suppliers, processors, packers, transport, wholesalers/agents, retailers, through to peak industry bodies, quality assurance, compliance and training organisations, researchers and research institutions, extension and outreach personnel and others. 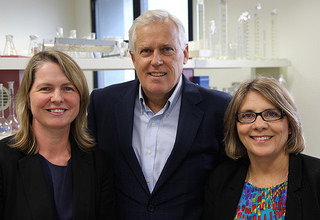 “The Fresh Produce Safety Centre has been established to address an important gap in our industry: to promote research, outreach and education on fresh produce safety throughout Australia and New Zealand,” the Board’s Directors said. The Centre’s Board of Directors said it would not be able to achieve its aims if it did not have the support of industry. Twenty organisations throughout the Australian and New Zealand fresh produce value chains and associated sectors have financially backing the Centre’s establishment. The Centre has also been supported by Horticulture Australia Limited and the Australian Government. The Centre, which is hosted by the University of Sydney, was registered with the Australian Securities and Investments Commission (ASIC) in May 2014. “The University of Sydney is delighted to host the new Fresh Produce Safety Centre: we see the Centre as the embodiment of the University’s desire to reach out to industry, identify research gaps and address research priorities in fresh produce safety,” said Professor Mark Adams, Dean of the Faculty of Agriculture and Environment at the University of Sydney. “PMA A-NZ has long recognized the gap in food safety in Australia and New Zealand: we are delighted to be supporting this truly trans-Tasman initiative,” said Michael Worthington, Director and CEO PMA A-NZ, a founding partner of the Centre.